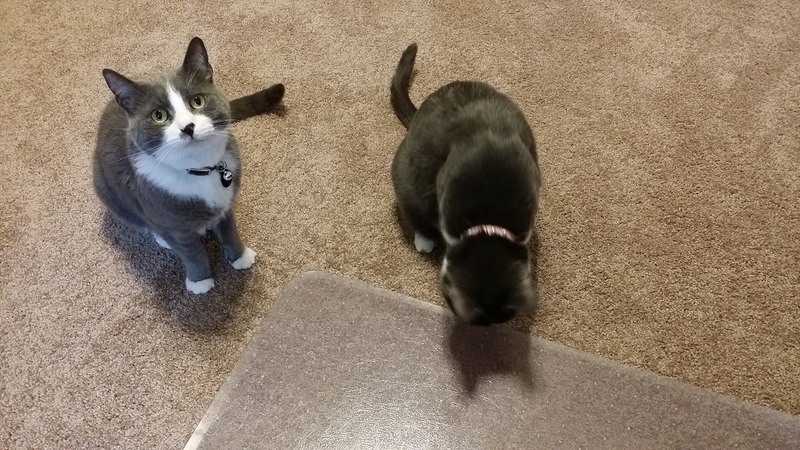 They are both wearing their collars with a bell so that neither one is startled by the other. Miss Thang especially, is still easily spooked, and I don't want to take a chance that something spooks her and Chaz is in the wrong place at the wrong time. The bell helps each of them know they are there. In most cases, only the aggressive/alpha cat should wear a collar with a bell when you get to this point, but in my case, both of my cats were fearful/aggressive, with Miss Thang more so. Some people may see all this effort to be frivolous, but if you love your cats, you would do anything to make it work. And it IS a lot of work. I am extremely lucky that I work from home and was able to work with these two as much as I did. I know that most people do not have that luxury, but it can be done. What really helped with this healing was Chaz and Miss Thang's bond. They've always been close buddies since she was a kitten. That makes a HUGE difference. If they weren't that close, then I'm not sure reintroduction therapy would have been as successful. Also, it helps that we don't have other pets (now) or kids, or a very chaotic household. This would have been harder if we had more than 2 cats, or dogs, or small kids. That's part of why we rehomed Leo, as we knew he and Miss Thang did not have a bond and there was potential for those two to have big problems in the future. It happens - cats area a lot like people in that sometimes they just don't like each other. For what ever reason, they will never be close and if there is extra stress/tension, well that's just a ticking time bomb. We will keep Miss Thang on Prozac for another 2 months, then slowly wean her off. Now my husband and I can plan to take some badly needed time off and get away for a small vacay without stressing out about these two!